The vivid, coloured check and contrasting splashes of colour make these trousers really stand out. The high waist and relaxed fit around the leg create a flattering shape, and the ankle-length drop means you can pair them with your favourite heels. The trousers are finished with contrasting piping down each leg and around the waist. Available in two colours: an orange check finished with cream waistband and piping, or a blue and brown check with navy details. 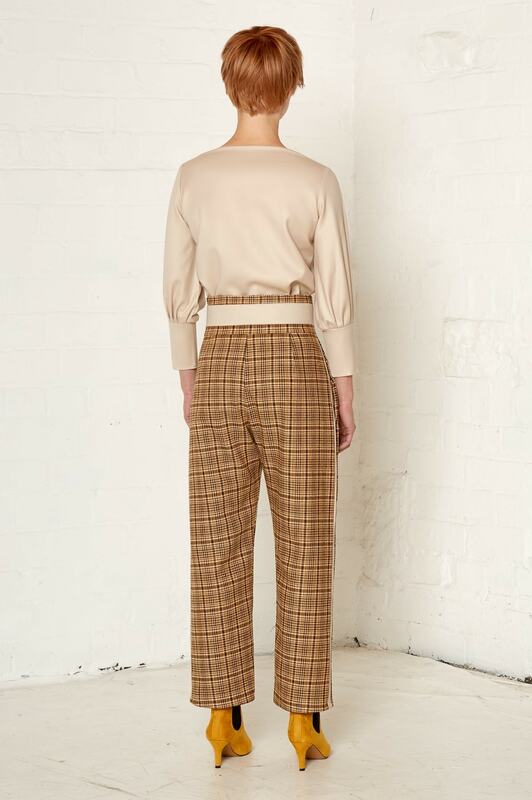 The trousers are finished with slit pockets and a centre-front zip. Cut from roll end soft wool blends, production will be limited to 30 pieces of each colour.